1.Support Mirror-link:Juct need a USB cable, you can build the connection to your Android Phone, and then enjoy the exciting games and more on the large screen. 2. 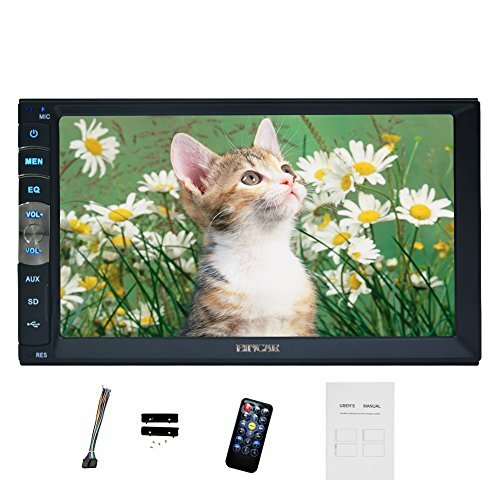 7 inch 2 din HD car radio player with 5 points multi-touch screen. 4. Support Bluetooth and hand free function. 5. Support FM and built-in Aux Input. 7. Support rear view camera input function. Support TF card(up to 32GB) slot and standard USB interface. Newest Capacitive Touchscreen: It's the same touch screen as in your smartphone with multiple points. A capacitive touch screen panel consists of an insulator such as glass.